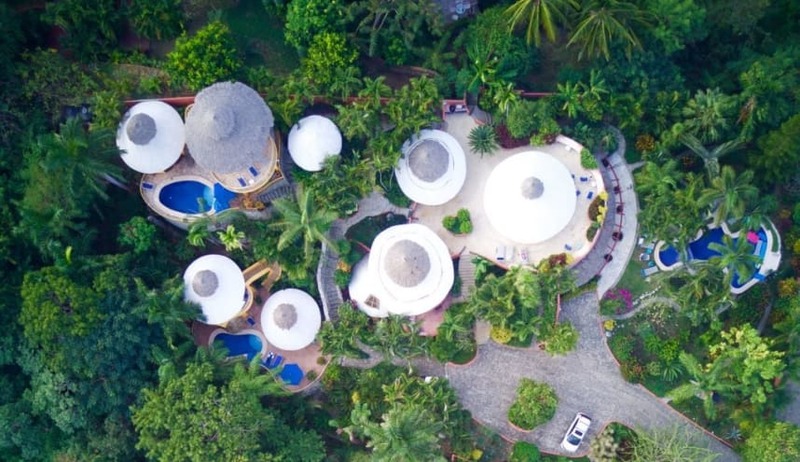 Casa Rana Verde in Sayulita is located at "Villas Rana Verde", Sayulita's premiere estate property on a beautiful gently sloped hillside with 360-degree views of the ocean and jungle, and only 75 yards from the ocean, in a tropical paradise in wonderful, sunny Sayulita! We are across the street from the ocean, just a 2 minute walk on cobblestone to the sand. We are in the exclusive "Pedregoso" neighborhood on the north side of Sayulita directly across the street from Villa del Oso. There are 3 villas on the property, but each one is separate and private from each other. Each villa has its own private pool, gourmet kitchen, living area, gardens, etc. In fact Casa Rana Verde has 2 private ocean view pools that are connected by a cascading waterfall. The wading pool is perfect for children and is right next to the adult pool. Nothing is shared between the 3 villas except for the free laundry, gated entry and cobblestone parking area. Our location is perfect for Events with capacity for 80 guests. Please view our Event Venue page. The villa contains three bedrooms and five bathrooms offering accommodations for up to nine people. Guests are assured tranquility and peace of mind during their vacation in this architecturally designed villa. Casa Mikayla and Casa Pajaro are close by, but located behind landscaping and walls to insure maximum privacy for all 3 villas. Make sure to view slide show of the panoramic ocean views and the incredible swimming pools in our tropical garden. The living area with its panoramic ocean views and huge gathering space is a great place to meet with the whole group, and dining there is a joy. We live right next door to the estate to insure that your vacation will be all you expect it to be. Our driver can pick you up at the airport in an air conditioned Suburban stocked with cold drinks. Our cook makes the best Mexican food in all of Mexico! We offer any or all meals to your group. Everyone loves our cook's meals. Wireless internet is included and we have free phone calls to and from the US and Canada. There is a free laundry that is solely for guests useage. This fully-furnished home features ocean and jungle views from every room. Enjoy our incredible living area that is 60 feet across while watching the sun set over the ocean! We have one of the best ocean views in Sayulita! All rooms are furnished with the finest amenities such as Ralph Lauren towels, 400 thread count all cotton sheets and all cotton linens, down and other comfortable pillows, best mattresses, Guatemalan fabrics for all curtains and pillow covers, furnishings that will allow you all the comforts you need while enjoying our incredible villa! Our kitchens are fully stocked with as many small appliances, frying pans, wine glasses, coffee cups, plates, bowls, utensils, etc. as you have in your own homes. Everything in the kitchen is in abundance. All the kitchenware is matching Fiestaware, matching high quality flat ware, hand loomed Guatemalan and Mexican all cotton napkins, everything the best! Remember many villas discourage children, but we cater to kids, we have (2) cribs and (2) highchairs, so no need to rent them. Our kiddie pool attaches to the main pool connected by a cascading waterfall. The kids love it, the parents love it even more! We have babysitting services available from our Mexican family of over 14 years, who are really part of our family. Our driver has multiple childseats for the trip from the airport. The best tropical garden in Sayulita is at your doorstep within private, gated grounds that feature over 20 varieties of palm trees, plumeria trees, many varieties of hibiscus, many varieties of bouganvilla, sweet jasmine everywhere, birds of paradise, gardenia, corona, maguey, abundant catii, almond trees, jamaica, bananas, papayas, Mandarin oranges, Persian limes, and much more. If you love to garden, this is a once in a lifetime opportunity to live in the midst of nature. Our lovely estate is home to the most beautiful birds that you are likely to witness outside the most complete aviary of exotic, tropical birds. We have identified over 100 varieties of these magnificent creatures! Without even leaving the estate you can view hummingbirds, orioles, tanagers, caliches, parakeets, parrots, woodpeckers, chachalacas, trogons, hawks, honeycreepers, warblers, and much, much more. There is an even larger abundance if you venture into the nearby jungle. This is a truly unsurpassed bird-lovers delight! Meander through our many cobblestone pathways into a tropical botanical paradise seldom seen on private grounds. Our other homes Casa Pajaro and Casa Mikayla are also located on the estate. All 3 villas can rented together with 7 bedrooms, 10 baths, 3 kitchens and 4 pools for a great wedding celebration, extended family or multi family vacation, holistic retreat or vacation camp! We have the best home, pool, garden, location, views and amenities in Sayulita and thus can offer you the best Sayulita Mexico vacation available! No matter how beautiful you imagine our estate to be, when you get there it is twice as beautiful!! This was an absolutely incredible property. Slept our large group comfortably and we felt like Sayulita royalty looking out from our terrace and pool into the Sayulita bay. We will definitely be back next time! I took my wife and whole family (17 people) for her 70th birthday. Rented all three casitas. Everyone enjoyed the lodgings so much. Barry (the owner) was present but not over bearing. He made sure all the maintenance and service help did their jobs and attended to any inquiries promptly. Room were beautiful and wonderfully decorated. This was a great value and I applaud the whole experience. Just returned from a week in Sayulita with 2 other couples, staying at Casa Rana Verde. This is truly a wonderful property! All the amenities were there and we all felt quite comfortable. Good location--easy walk into town and to the quiet, beautiful beach. The layout provided opportunities for privacy along with ample space for togetherness. The beds were very comfortable, everything was clean and the rooms and kitchen were well appointed. We had a few glitches that were promptly addressed by Barry. We had a delicious meal prepared for us one night--truly the best chile rellenos, chicken mole, and flan ever!! We would definitely recommend this property! My wife and 2 other couples stayed at casa rana Verde for a week. The property was pristine. The panoramic ocean view never gets old and while there is great gathering areas for all to hang out, you also have the option for privacy. The staff is more than helpful yet seem to stay out of sight. If you can take Barry up on having meals made for you. Ceviche, mole, guac, fresh tortillas etc. All amazing. My only issue is figuring out how quickly we can get back down there. Do your self a favor and don't pass this one up. 21 of my family members stayed at this gorgeous compound and we all felt like we had our own space. The children were in Heaven on earth! The views were breathtaking, the ammenities top notch, the grounds were awe inspiring (blooming with life and love). The central palapa was perfect for gathering, watching the gorgeous sunsets, playing games, feasting and just being together in the beauty of our surroundings. Lucia's food was beyond incredible and made with love and joy, fine dining in Paradise for sure! Her daughter made 2 cakes for us during our stay and they were both incredible and worth every penny and more. Lucia and Rosie replinished our casas with care everyday. Chuy was a Light and an artist in the gardens and we enjoyed seeing his smiling face everyday. Incredible views from an amazing property! My group of 14 family members just returned from celebrating a wedding at Villas Rana Verde. We had the time of our lives and thoroughly enjoyed our stay! The casas are very nice, the kitchens are equipped and set up beautifully and the outdoor living area is perfect for everything from enjoying your morning coffee to dancing the night away! The pools are wonderful and the grounds are absolutely gorgeous, providing many opportunities to sit back and soak in the views and observe all the local birdlife. Our hosts were very gracious and we couldn't have asked for a more perfect location to celebrate a wedding. We hope to return to Casa Rana Verde much sooner rather than later! LOCATION! ACCOMMODATION! EMBRACE TRANQUILITY! EMBRACE FESTIVITY! Live the vacation dream at Casa Rana Verde and Casa Mykayla! Family of 10 adults had plenty of privacy and gathering space. We researched and read 100's of reviews to find THIS VERY SPECIAL CASA! 5 couples each had a suite with bragging rights. While some had a veranda, others enjoyed their private garden patio. 5 completely separate suites, 2 full Kitchens, laundry house, 3 additional half bathrooms, 2 pools & wading pool with waterfall, all perfectly landscaped into the side of a cascading hill. Views are intoxicating! Stonework, gardens, true Mexican architecture, colorful decor and furnishings plus fresh flowers to greet you. Barry and Connie made their casa our casa. They treat their staff like family and that's how we were treated by them! Transportation driver, gardener, cooks, maids all arranged by Barry. Communication was consistent and timely in answering all our questions for months before our arrival. These special casa's in the North end of Sayulita beach is the place to celebrate with family and friends. All the reviews about are absolutely true! Four friends, my fiancé, and I stayed at Casa Rana Verde for a week in January. The property was beautiful and immaculately groomed. Each villa was unique and extremely comfortable. The common areas (the pool and the patio) were great places to hang out and offered amazing panoramic views of the ocean and surrounding hillside. Sunset views from the patio were picturesque. The beach was a quick walk and was usually empty. It was like having a private beach all to ourselves. Town was just a short walk away. Barry and Connie could not have been more accommodating. They live next door, so they were always accessible while never being intrusive. They offered a lot of local knowledge and were happy to provide suggestions for restaurants and activities. They even arranged a ride back to the airport for us. Casa Rana Verde was a bargain. We'll be back! Over Thanksgiving, our family stayed at Casa Rana Verde and Casa Mikayla in Sayulita. If you want a fresh experience of Mexico away from the concrete box hotels of Puerto Vallarta, this is it. First of all, the location is breathtaking. We had 360-degree sea views from almost every vantage point with beautiful jungle and tropical landscaping in between. Second, you can't beat the ambiance of the villas. Casa Rana Verde is a roundish, three-story structure. My husband and I stayed in the top-floor room, which was beautifully decorated with Mexican paintings and artifacts and, as all rooms are, included a beautiful tile bathroom with views of the sea as you shower. On our level, was also the separate kitchen and a large, common area. The common area was the gathering place for our kids and grandchildren at every meal and at night, where we played cards, games, read, and just relaxed. The area is well-lit and has fans under a beautiful palapa. The views were extraordinary, day and night. Our daughter and family occupied the floor below us, where she and her husband and two boys had plenty of room for sleeping. Every room has a full bath. The bottom level contained a large bedroom and bath and was adjacent to the beautiful pool that accompanies Casa Rana Verde. The pool overlooks the ocean, and has great lounge chairs and water sport items. Our son and family occupied Casa Mikayla, a separate villa with its own pool. They also had a separate kitchen and a large sleeping area. Town is about a ten-minute walk, but there are restaurants closer to the units if you don't want to walk all the way in. In town, there are many bars, restaurants. a colonial-style main plaza, shops, and, of course, the beach. Makes for interesting people watching. The beach near Casa Rana Verde is wider and more private and is about a 3 or 4-minute walk from the unit. There is also a third villa in the complex, Casa Pajaro, which was occupied another family. Luisa cooked for us on Thanksgiving. No turkey, but fabulous Mexican specialties. The flan was outstanding. Angel will pick you up from the airport, stop for groceries, and take you back again. Very reliable. Very highly recommended. We'll probably return next year. 25% off all bookings for any time during 3/23/19-4/25/19!! Panoramic Ocean views everywhere, 2 private pools, 2 minutes walk to the sand! Please contact us via the form by email or telephone, we look forward to welcoming you to Sayulita!